Its name speaks for itself. 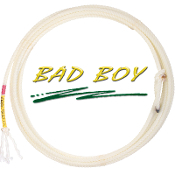 The Bad Boy is one of the most popular ropes on the market. 100% nylon fibers are individually spun to ensure quality and consistency. This head rope is fast and durable with a firm feel. Nylon 3-Strand, Length: 31' Diameter: True, Available Lays: Super Soft (SS), Extra Soft (XS), Soft (S).